Because I Told You So: Book Report: "The War of the Worlds"
H.G. Wells was a visionary with a frighteningly accurate view of the future and the potential applications of space and science to everyday life as he saw it in the 19th century. Thankfully, his prophecy here has yet to come true. A bleak glance of despair at an apocalyptic battle with opponents superior to humans in every capacity save for griminess, his story is that of a survivor who wins his life in the face of impossible odds, only to realize he has lost everything he cared for. 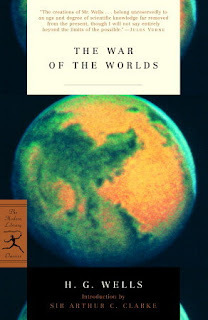 By avoiding the macro scale of species vs. species battles that his title portends and focusing on an intimate tale of endurance, Wells leaves his readers free to imagine what's going on in the rest of the world. His influence on apocalyptic, aliens vs. humans sci-fi is incalculable. Pretty much every story that followed Wells is little more than a recasting of the template he set here.